Studies investigating whale-watching boats and the inner ears of marine mammals could soon provide new insight into the effects of noisier oceans on cetaceans – dolphins, whales and porpoises – who depend on their hearing for navigating, finding food and communicating underwater. Noise in our oceans is increasing due to human activities such as shipping, seismic surveys, the construction of offshore windfarms and whale watching. A popular tourist activity, whale watching is known to disturb the mammals that people come to see. In Iceland, for example, minke whales were found to decrease the amount of time they spent feeding when a vessel was nearby. But whether these behavioural changes are linked to underwater noise is unknown. ‘What people have studied in the past is the actual presence of the boat,’ said marine biologist Dr Kate Sprogis from Aarhus University in Denmark. Dr Sprogis would like to pin down the effect of boat noise itself, which she is investigating as part of a project called NOISE. Her team is focussing on how humpback whales respond to the sound of small whale-watching vessels in shallow coastal waters, which typically doesn’t travel as far as acoustic waves deeper down. ‘We don't know much about how that sound affects the animals,’ she said. The researchers performed experiments off the coast of Exmouth, Western Australia, where they changed the noise level of their boat as they travelled past humpback whales at a distance of 100 metres. They observed different behaviours, such as the direction the whales were heading, to determine whether this changed when boat noise was present. Mothers feeding their calves in breeding grounds were particularly of interest. If underwater noise disrupts resting mothers, they may be disturbed from feeding their calves. ‘The calf has to migrate back with (their mother) to cooler areas and it might not be able to do that if it's not big enough or strong enough,’ said Dr Sprogis. 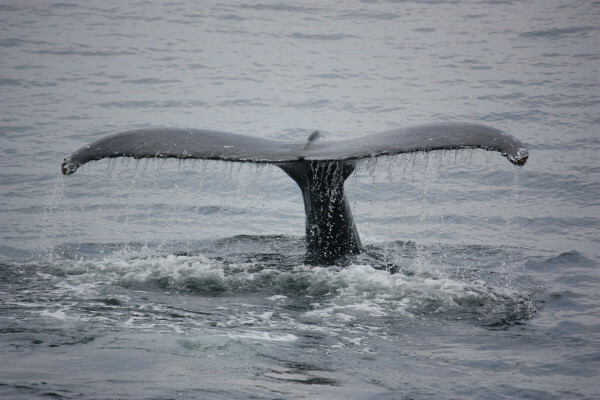 Preliminary results suggest that noise level has an impact on whale behaviour. ‘What I'm finding is that from a quiet boat to a loud boat, at the same 100 metres, that loud boat is causing the animal to stop what it's doing and swim away,’ said Dr Sprogis. Later in the year, the team will return to the same spot to investigate the effect of boat sounds on the whales from three different distances. In some countries, such as Australia and New Zealand, regulations stipulate that vessels must stay at least 100 metres away from animals. However, they aren’t based on the effects of noise. ‘The aim is to be able to tell whale-watching bodies about our results so that people can incorporate them into their guidelines worldwide,’ said Dr Sprogis. The findings from the project will also hopefully lead to the design of quieter boats, or modifications to existing ones. A better understanding of cetacean hearing should also help set limits for underwater noise. Although sound is the primary mode of communication for these species, we have limited insight into how they hear. The lack of knowledge is partly because studying cetacean ears is a challenge: they must be obtained soon after death before they start to decompose. ‘We only have a window of a few hours to collect and fix the ears in stranded individuals,’ said Dr Maria Morell, a biologist from the Institute for Neurosciences of Montpellier in France. What we do know, however, is that repeated exposure to sound at certain frequencies and intensities can cause hearing loss in mammals. ‘Hearing impairment is particularly detrimental for these species since they depend on hearing for all their daily activities such as finding food, communicating and navigating,’ said Dr Morell. As part of the Cetacean Inner Ear project, Dr Morell and her colleagues are aiming to better understand how whales, dolphins and porpoises are able to hear high-frequency sounds and how underwater noise might affect their hearing. They are examining tiny structures in their inner ear, which is responsible for detecting sounds, and comparing how they differ across stranded individuals, looking for lesions, for example, that could result from exposure to noise. By collaborating with organisations from 31 countries that research or investigate strandings, they receive cetacean ears from various locations. ‘It is very valuable to have an overview of individuals coming from several oceans which may have been exposed to different sound sources,’ said Dr Morell. The team is also trying to assess hearing range across different species. Each frequency is detected by a specific part of the cochlear spiral in the inner ear, where sound vibrations are converted into electrical signals that are sent to the brain. The researchers are creating frequency maps that predict the distribution of frequencies along this spiral since the layout varies across species. If lesions from noise exposure are found at a given location on the cochlea, the maps could allow the source of the sound to be identified from its frequency. So far, the researchers have developed a method for analysing the sensory cells of the cochlear spiral that will allow newly formed and chronic lesions to be distinguished for the first time. Results from the project should better inform policymakers about how noise can affect cetacean hearing, allowing them to evaluate the impact of local marine activities and improve regulations. Dr Morell thinks that noise from seismic surveys, military sonar and pile driving during the construction of offshore windfarms possibly has the biggest impact on animals since they are the loudest sources within the hearing range of cetaceans. Furthermore, analysing ear damage in cetaceans should also reveal causes other than noise pollution. Hearing can be affected by several other factors such as age, infections or physical trauma. ‘The study of the inner ear contributes to the health assessment of wild cetacean populations,’ said Dr Morell. Is there more water in the atmosphere or the oceans?